NCERT Textbook Solutions are considered extremely helpful when preparing for your CBSE Class 6 Science exam. TopperLearning study resources infuse profound knowledge, and our Textbook Solutions compiled by our subject experts are no different. Here you will find all the answers to the NCERT textbook questions of Chapter 12 - Electricity and Circuits. All our solutions for Chapter 12 - Electricity and Circuits are prepared considering the latest CBSE syllabus, and they are amended from time to time. Our free NCERT Textbook Solutions for CBSE Class 6 Science will strengthen your fundamentals in this chapter and can help you to score more marks in the examination. Refer to our Textbook Solutions any time, while doing your homework or while preparing for the exam. (a) A device that is used to break an electric circuit is called __switch__. Concept insight: A switch is an electric device that is used to break a circuit. When the switch is in 'OFF' position, then the circuit is not complete. Such a circuit is called an open circuit. An electric current cannot flow through this circuit. (b) An electric cell has __two__ terminals. 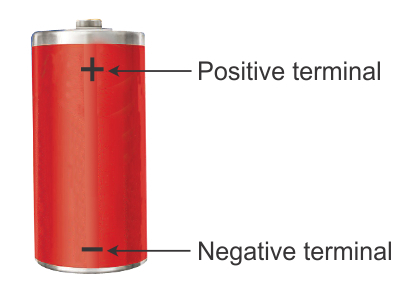 Concept insight: An electric cell has two terminals, a negative terminal and a positive terminal (as shown in the given figure). Concept insight: Metals are good conductors of electricity. Hence, an electric current can flow through metals. Concept insight: Jute string is a bad conductor of electricity so it cannot be used to make a circuit. Concept insight: Thermocol is a bad conductor of electricity. Hence, electric current cannot pass through it. From the given figure, it can be observed that one terminal of the bulb is connected to a tester holder (it is made up of plastic). A current will not flow through the circuit. Hence the bulb would not glow. Concept insight: Electric current cannot pass through objects such as plastic scale, tester holders, etc., because these objects are bad conductors of electricity. Concept insight: If a circuit is not complete, current will not flow through the circuit. A switch is an electric device that is used to complete or to break an electric circuit. If the switch is 'ON', then a current can flow through the circuit. 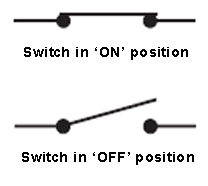 However, if the switch is 'OFF', then the current cannot flow through the circuit. Electrical appliances such as table fans, electric lamps, washing machines, juicers and mixers, TV, radio, etc. have switches built into them. Concept insight:Switch is device which regulates the functioning of a circuit by opening or closing a circuit. Erasers are bad conductors of electricity. They do not allow electric current to pass through them. The circuit becomes an open circuit. Hence, the bulb will not glow if the safety pin is replaced by an eraser. Concept insight: Bad conductors of electricity do not conduct electricity. For example: plastics, eraser etc. The bulb will not glow. This is because the two terminals of the cell are connected to the single terminal of the bulb. This is equivalent to the bulb not being connected in the circuit at all. The two terminals of the cell should be connected to the two terminals of the bulb. Concept insight: Two terminals of the bulb should be connected to the two terminals of the cell, otherwise it will not glow. 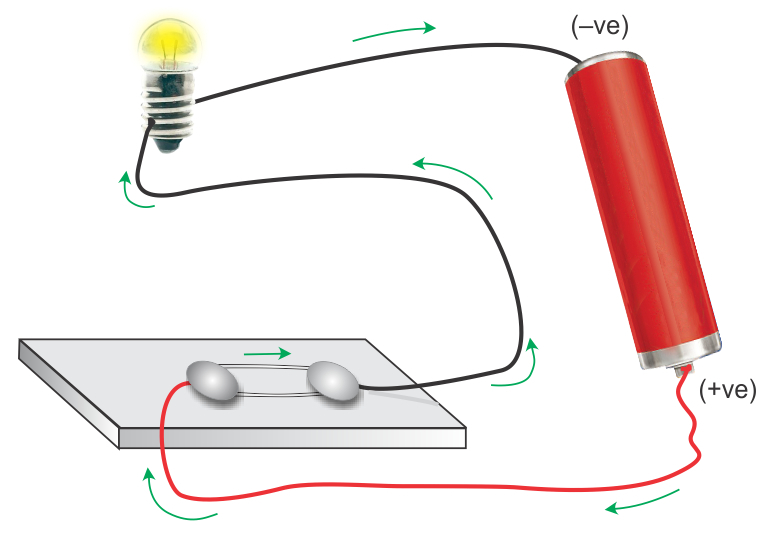 When the two free ends of a conductor tester are touched with an object, then the bulb of the tester would glow if the object conducts electricity. However, the bulb would not glow if the object does not conduct electricity. 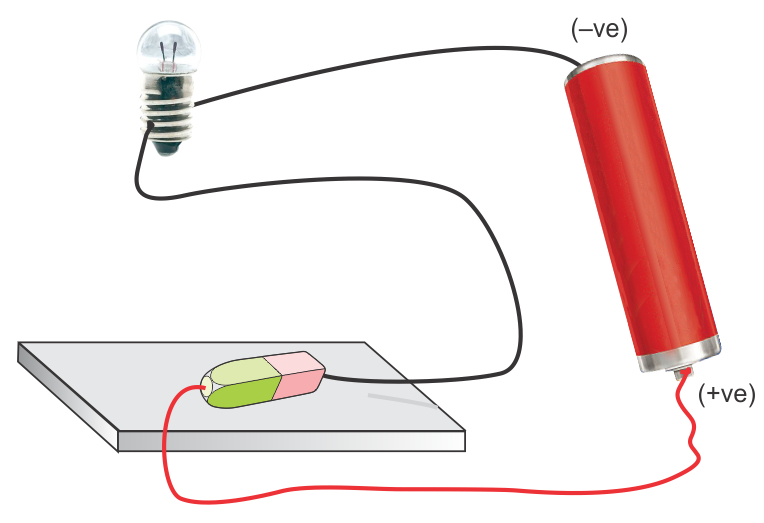 Since the bulb glows when the tester is touched with the given object, the object must conduct electricity. Hence, the given object is a conductor. Concept insight: A good conductor allows electricity to pass through it. An electric switch is an electrical appliance which conducts electricity through its internal parts. When its internal parts are touched with naked hands, then it may cause an electric shock. Therefore, it should be touched with rubber gloves in hands because rubber cannot conduct electricity. Hence, electricians should wear rubber gloves while repairing a switch or any other electrical appliance. Concept insight: Rubber is a bad conductor of electricity so it protects the electrician from electric shock while repairing electrical switches. Rubber and plastic are bad conductors of electricity. They do not allow electric current to flow through them. Hence, handles of tools such as screwdrivers, pliers, etc. which are used by electricians for repair work usually have plastic or rubber cover on them. This protects them from electric shocks. Concept insight: Plastic and rubber are bad conductors of electricity. TopperLearning provides step-by-step solutions for each question in each chapter in the NCERT textbook. Access Chapter 12 - Electricity and Circuits here for free.